Tomorrow brings Io's most interesting eclipse this mutual event season as most of Io's trailing hemisphere (51° West-231° West) is plunged into darkness by Jupiter's largest moon, Ganymede. This is the culmination of a series of weekly eclipses by Ganymede on Io. 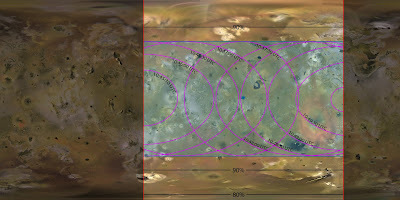 With each weekly eclipse, the center of Ganymede's shadow appears further south on Io. Tomorrow, the center of Ganymede's shadow passes just north of Io's equator. The eclipse takes place tomorrow morning, July 15, between 10:45 and 10:50 UTC (3:45-4:50 MST) on Io. If you have a good telescope and want to try to observe this event, from Earth the penumbral shadow of Ganymede will reach Io at 11:19 UTC, totality will run from 11:21 to 11:25:28 UTC, and end of the eclipse comes at 11:27 UTC. The peak of the eclipse, as observed from Earth, comes at 11:23:14 UTC. The timing of this eclipse should make it a good observation target for observers in the western United States, western South America (like the European Southern Observatory), and Hawaii. During the eclipse, Ganymede will appear 13' 17.2'' across in Io's sky (compared to our moon, which appears around 30' across in Earth's sky). The sun will appear 6' 19.9". Therefore, it is unlikely that the sun's corona would be seen during the eclipse except near the beginning and end. At its peak near Tol Ava Patera, the eclipse will last 1 minute and 55 seconds long. 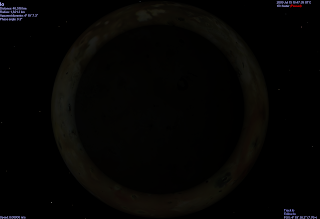 Computer Animation of the total eclipse of the Sun by Jupiter's moon Ganymede over the trailing hemisphere of Io on July 15, 2009. First half shows a view from 4500 miles above Io's trailing hemisphere. Second half zooms in on the sun from east of Ra Patera showing the total eclipse. The animation runs from 10:40 to 10:55 UTC on July 15, 2009. I have also created a nice map showing the area on Io that will experience this eclipse. You can download a full-res version here. My post last year on this mutual event season should help provide some information on the science of these types of eclipse as well as occultations.